Contech manufactures Crane Scales for weighing upto 50 ton. Options available are remote key panel, heat shielding for high temperature application in foundries, Metallurgy and wireless remote Indicator. Rugged aluminum diecast enclosure for Models upto 20 ton Multiple print options with Sr. No, Date, Time & Weight in horizontal / vertical mode. Steel heavy duty enclosure for Models above 20 ton. Date & Time entry facility. 25 mm height LED display for Models upto 20 ton & 38mm height above 20 ton. 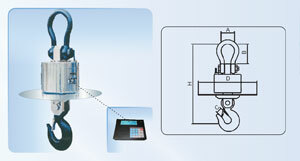 Multiple weighing units. Inbuilt sealed maintenance free re-chargeable battery and battery charger (Optional) Power saving by switching off the display. Infrared remote keypad, operating distance 10 mtr (Optional) Automatic zero tracking. RS-232 Interface (Optional) Software linearity correction. Display hold facility. Gross & Net Weight function. Special construction for high temperature shielding. Minimum distance for normal operation is 2 mtr from a heat radiation source at 1500oC. Wireless transmission maximum operating distance from the Indicator is 100 mtr. Graphical backlite LCD display in the Indicator.